"This is the 'salsa de tomatillo' that I grew up with. It can be used as a sauce for grilled chicken, fish or shrimp, as the basis for green chilaquiles (pour over tortilla chips, shredded cooked chicken and shredded Monterey Jack, then heat under the broiler), and as a dipping sauce for chips. Delicioso!" Place tomatillos in a nonreactive saucepan with enough water to cover. Bring to a boil. Simmer until tomatillos soften and begin to burst, about 10 minutes. Drain tomatillos and place in a food processor or blender with onion, garlic, jalapeno peppers, cilantro, salt and pepper. Blend to desired consistency. 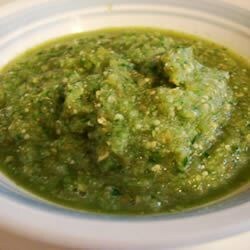 A simple, authentic green salsa with tomatillos, onions, cilantro, and garlic. Roasting the tomatillos results in a much thicker salsa with the added flavor from roasting. I tried this poured over chicken with melted monteray jack and yellow rice on the side and it was yummy. This salsa has some kick! This was good but not great, next time I will serve with tortilla chips and cheese. This recipe is extremely easy to prepare. Plus, it takes great too! Thanks.